So I've decided to get a tower bimini for my RLXI that has a titan II tower on it. I can't decide between the titan bimini and the one from towerbiminis.com. Does anyone have any comments on either of these biminis or the pros and cons of each one. I'm also going to add some tower lights and speakers this summer so I was concerned about the bimini obstructing them when it is in the upright position. I've also only been able to see the titan bimini in person on a titan III tower at the dealer. Any pics of either bimini on a titan II tower would be helpful too. Towerbimini.com all the way. They are awesome!!!! I would also like to do a Strapless Tower Bimini on a Titan I, anybody have any pics they would like to share? Well I ended up just ordering a titan bimini from my dealer. The price for the towerbimini.com one was a little too steep for me. I would have liked to see some more pics of both of them on a titan II. I'm hoping the titan bimini will look good and provide enough coverage. There is alot of great pics on the towerbimini.com website of their biminis. Hey Trevor, I see lots of pics of Biminis on TowerBiminis.com but where do you see "Titan" biminis ? There is only one pic on the third page in the gallery. 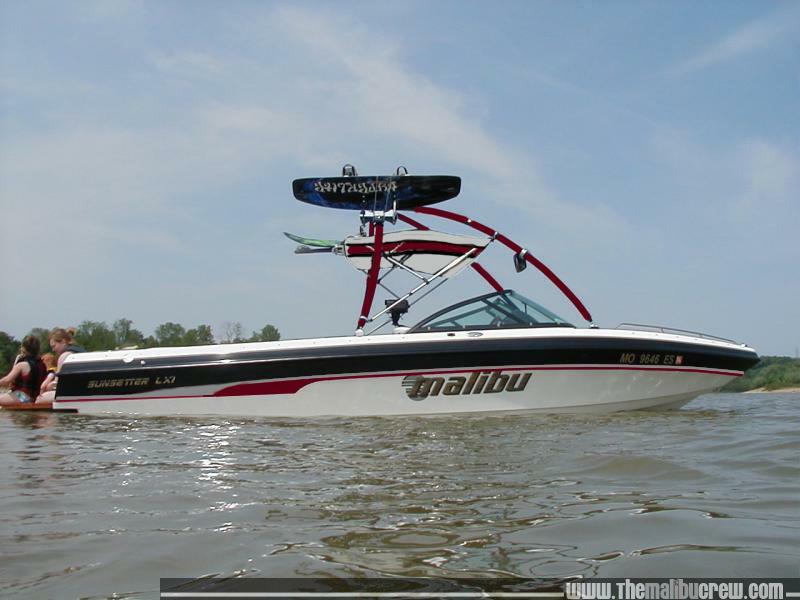 It's a polished titan II on a red, white and black Malibu XTI. You will like the Titan bimini. I have one on my SLXi w/Titan I. It is easy to put up/take down and privides plenty of shade for the driver and observers seats. I guess I'm a little slow, Which gallery, at which site? Sorry Texasguy, I completely misread your other post. The pic I was referring to was of a towerbimini on a titan tower at towerbiminis.com (Here) . I have not been able to find many decent pics of the Titan brand bimini for the titan tower. I got a few pics from titan of their biminis and I browsed through the rides on wakesiderides to look at the titan towers with biminis on them. (I think most of them were titan biminis). It sure would be nice if titan would update their site with some of their products. If you want some pics of the titan biminis I can email them to you. Here's a couple pics of my Titan bimini w/ Titan II. Also am I a little slow, does Titan have their own website? 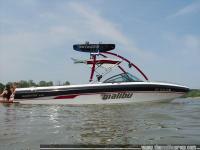 Does anyone have any opinions on the titan bimini?? I'm not exactly sure what the titan bimini will be like since I didn't get to see it in person before I ordered it. I LOVE it. I had a bimini similar to the titan bimini and it wasn't really okay. It had very little coverage. This one rocks. Looks great! Do you have any photos of your bimini closed? Can you still walk under it when it is closed? Slurpee, love your Towerbimini, I remember your "expeirence" with the other bimini but was your first attempt a Titan Bimini? From what I can remember you did not take any pictures at that time because you were, shall we say ... "less than pleased". Titan's website is kinda lousy. From what I remember most of the canvas shops get all the hardware from Titan and then cut your sunbrella to order themselves. The bimini that *I* had made on Waterski America's reccomendation from Dallas Boat Canvis and Covers for the Titan was not up to the Titan Bimini standard. Here's a photo of the Titan Bimini that you can compare to mine from earlier in the thread. If you want to see the bimini that I ended up with originally, then look at this photo for an example. When the towerbiminis.com bimini is in it's boot it is plenty tall enough to walk under. You have to duck your head a bit if you're tall, but it doesn't really get in the way at all. I've been out several times this winter with it up and haven't been inconvenienced nearly as much as I was with the Titan bimini.